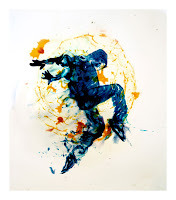 In one of our posted discussions, we talk about what defines a fine art print. 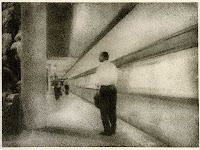 This might be a good example shared with us, by George Smyth and his Bromoil method. Despite an apparent resurgence of interest in traditional film photography, digital imaging is quickly pushing silver gelatin print creation into the miscellaneous category known as alternative processing. Those of us who have spent a lifetime working with this traditional process may feel a sense of loss, but the truth of the matter is that it can open a new set of possibilities. 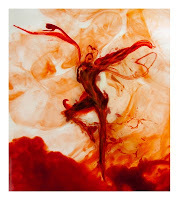 For years I have worked with the Bromoil process, which was first popularized about one hundred years ago. Other than the silver gelatin process, it is the only alternative process that allows for projection, as opposed to requiring direct contact of the negative with the paper. As many people have never seen a Bromoil print (I had not seen one at the time I started making them), I will first explain what a Bromoil print is, then explain how current technology can facilitate the process. 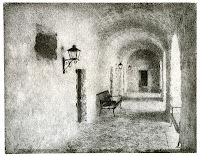 The creation of a Bromoil print involves a number of steps. The first is the creation of a traditional darkroom print, but that is used as a guide print to reference at a later time. A second print is made, normally exposed twice as long as the guide print under the enlarger, and given a grade less contrast. This is the print that will eventually become a Bromoil, but must first be dried overnight. The following day the print is bleached and tanned. Typical photographic bleaches merely remove the silver from the print, but the type used in this process also tans the print. This means that it hardens the emulsion relative to the amount of silver that was in the print. Areas that held shadow values will have the emulsion hardened considerably, whereas the highlights will have had the emulsion hardened very lightly. The paper must then be dried again overnight. Finally the print can be inked. To begin, it is first soaked in water for about 15 minutes. This allows water to saturate the emulsion, and will do so relative to its hardening - the softer the emulsion, the more water that area of the print will hold, the harder the emulsion the less water that area can hold. The paper is then removed from the soak and all surface water is removed, so the only water remaining is within the emulsion. It is laid on a sheet of glass to keep it flat and provide a hard backing. A stiff brush, often made with hog's hair, is tapped on ink-covered tile to charge it with ink, and then with various tapping motions of the brush, the ink is transferred to the paper. As this is done, the highlight areas (where the emulsion holds the most water) reject the ink, while the shadow areas (holding little water) accept the ink. Eventually the paper will dry out and need to be resoaked before more ink can be properly applied. After several thousand taps of the brush on the paper, the image is ready to be dried, touched up, and displayed. Digital technology, for me, has an important place to play in the process. As time goes on, the number of papers that can be used with the Bromoil process become fewer and fewer. Older papers, like Kodak Ektalure and Agfa MCC118 are no longer produced, so old stocks become more and more dear. The last thing I want to do is to waste any of this precious stock with test strips and errant exposures. The ability to create a digital negative means that I can contact print any image that I have taken. Equally important, as a paper like Kodak Ektalure is a single contrast paper, as long as I have matched a curve for it, what I see on my monitor can be reproduced in the darkroom. The take-away is that a new technology can open capabilities with older technologies. 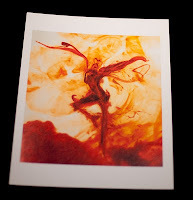 In my own particular case, I will not only be able to create more Bromoil images from my stock before having to rely on more modern, and less capable, papers, but since I do not have to run tests before making a final print, I can be more productive with this time consuming, labor intensive process. Plenty of people will disagree with me on this, but I’ll claim that the vast majority of so-called “fine art prints” come from a pretty narrow set of methods. On the digital side, you mostly have your Lightjet print and your pigmented ink print. Film, having been around a lot longer, gives us a slightly wider gamut of silver prints, platinum prints, various chrome prints, cyanotypes, etc, with most of them being slight variations on the same basic ideas. The point is, we’re pretty set in our ways. One walk through a large event like Photo LA and you’ll probably be able to count on two hands the number of printing methods in use. I’ve used the mainstream methods as much as the next guy, but I’m also a strong proponent of experimentation and alternate processes. The question should be, “what medium and process best allows a particular image to find its voice?” If, as a fine art photographer, my prints are what will ultimately be my art, then I can’t just automatically pump things through the “archival pigmented ink on photo rag” process simply because that’s what photographers are doing at the moment. What happens when you print this image on wood? What happens when you print this image on aluminum? What can I do that will make the image more than just color or value on a surface? More recently I’ve been experimenting a lot with what I call “pigmented wax prints.” The idea was actually born about from a conversation I had with a gallerist at a portfolio review event earlier this year. In the process of discussing a particular body of work, she again and again kept coming back to the idea of the images needing “another dimension” to really connect in the right way; either in the subject, or the message or the printing method itself. Discussing further, the idea arose of finding a way to actually bring aspects of the subject itself back into the printing method. Obviously, this isn’t something that’s often done. It’d be like printing a photograph of a person on human skin or, certainly less macabre, printing a photograph of a tree on wood. Immediately we’re into the territory of a fairly non-traditional process, but the idea is a solid one: bring the subject full circle. I’d already been toying around with a concept for a series of somewhat abstract photographs using liquid wax as a subject, so it seemed only natural to see if there was a way to bring wax into the actual printing process… a sort of reconnection with the encaustic painting methods popular at various times throughout history. Thus began a fairly long process of research and experimentation seeing about ten months from the initial concept until I actually held a real print in my hands. I’m not going to share specific details of the final process, but my journey did reunite me with a technology I’d not touched since the early 1990s – solid ink printing. This effectively boils down to a process that combines organic dyes with vegetable waxes, then applied to various media using a method quite similar to that of inkjet printing. From afar the prints, depending on the paper used, are virtually indistinguishable from a standard pigmented ink print. Colors are vibrant, gradients are clean. But up close, there’s a different quality to the print – it actually looks waxy. This is not your standard “photograph” in the least. The subject has been brought full circle. If you would care to share work,technique,philosophy as a Fine Art Photographer..please contact me at my email address..
all images are copyrighted by the artist.Usage without written permission strictly prohibited by law.